Broadway World presented Super Squares™ to their readers in the Geeks News Desk. Read the original article here. Over the last two months, React LLC launched Super Squares™ on Android and iPhone versions with the AFC Championship football game, followed by the Pro Bowl, and then the “Big Game” this last Sunday. Genesis Communications partnered with React, LLC on the contest. A full winner’s listing is at: https://supersquares.com/schedule_prizes/winners-page/. That approach won big for Richard Shockley of Palm Harbor, whose Perfect Super Square “Y” in the 3rd Quarter matched the 29-26 score. Shockley was selected as the winning entry for a new 2017 Nissan Altima from Fuccillo Nissan, announced live on Q105 and WQYK radio. Click here to listen to a live recording of Shockley receiving the news. Nearly half of players were women, meaning advertisers have a huge opportunity to reach audiences that other channels neglect. The vast majority of players stayed with the game, despite relatively lower TV ratings during the Pro Bowl, proving the game can create loyal followers. React plans to keep expanding the Super Squares™ system, and this autumn will support football games across the country, and add a wide variety of sports, such as basketball, hockey and even NASCAR. For the full article visit Broadway World. 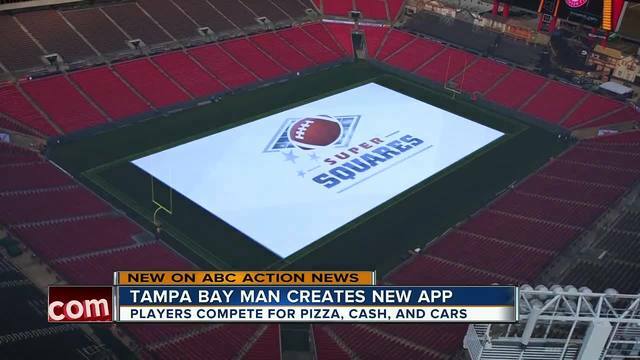 In a feature on ABC Action News in Tampa Bay, Super Squares™ founder and inventor, Frank Maggio, was interviewed about the live sports game app which allowed viewers at home the chance to win cash, prizes and a new car during the Super Bowl. The Super Squares™ live sports game app was featured in Pittsburg’s TRIB Live in an article by Patrick Varine about how the AMVETS ad which was rejected by the NFL will be shown to fans playing Super Squares™. Thursday, Feb. 1, 2018, 2:57 p.m. The AMVETS’ “Please Stand” advertisement, encouraging citizens to stand during the playing of the national anthem at sporting events, may have been rejected by the NFL for inclusion in the Super Bowl LII program. But several million people will have a chance to see the ad campaign thanks to a partnership with a Florida-based technology company. React is beta-testing its new “Super Squares” app, a free-to-play, live game-show app that operates during commercial breaks of live football games, quizzing users with questions about the football game they’re watching as well as the ads that run on the app. Initially tested during the Jan. 21 NFC championship game and the Jan. 28 Pro Bowl, it will now be active during Super Bowl LII with $50,000 and a new car up for grabs as prizes. It also gives AMVETS a chance to get its message out to more than 4.2 million people. The app’s reach is not nationwide because it awards cash prizes to participants, and Florida gaming regulations limit winners to a seven-county eligibility area. The ad campaign is also available to view on the AMVETS national website. AMVETS’ 30-second “#PleaseStand” ad encourages citizens not just to rise for the country’s anthem, but also to engage in other civic pursuits such as voting and volunteering. To see the entire article visit TRIB Live. Super Squares™ was featured on Fox13 Tampa Bay by Haley Hinds, FOX 13 News. In the article titled “Live sports gameshow app exclusive to Bay Area“, the article mentioned that even though Buccaneers fans don’t have a team still in the running, they can still have a lot to cheer for if the play Super Squares™ during the game. Maggio explained that when a football game goes to a commercial break that people’s eyes move to their phones and that he wants to create a way for people to want to watch advertising by making it fun. People pay attention to the game and to ads from the sponsors and then they answer questions and earn points. There are a total of 22 questions over 3 hours and you earn squares based on getting the answers correct. Then, you watch the score of the game and if your square matches the game score you earn more points and advance up the leaderboard. To see the full story and a video visit Fox13. Super Squares™ featured on ABC Action News WFTS Tampa Bay. In an on air story by Julie Salomone, Super Squares™ was featured as an exciting new Game Show App that allows people watching football to win pizza, cash and cars. Visit WFTS for full story and video highlights of the Super Squares™ app. In the interview with Frank Maggio, the local entrepreneur and creator of “Super Squares”, he explained that it’s a live game show app and it launched for the AFC Championship Playoff Game. According to Maggio, “Live game shows are among the hottest trends in mobile apps right now,” The game is played on cell phones and it mimics football squares. Players follow a live football game and then answer questions. They are competing to win pizza, cash and even a car. Visit ABC Action News WFTS for the full story and video that shows highlights of the Super Squares™ app. “Interactive advertising pioneer React is opening an exclusive beta test of the “Super Squares” live game show app that gives players real cash and prizes for answering live quiz questions about sports events, and the TV commercials that run during breaks inside the app. More than $50,000 in cash and prizes are on tap to be awarded over a three-weekend span, to up to 65,000 adult residents of the seven county greater Tampa Bay metropolitan region. The patented technology was developed by long-time Tampa-area advertising innovator Frank Maggio, whose background includes inventing ReacTV®, the first live interactive game show for PC’s and smart phones synced to cable TV systems. Maggio’s passion for sports-related games date back to a windfall he claimed from an 1985 nationally publicized contest he solved, claiming over $20 million in prizes. Visit NBC-2 to see the full story.